I have been reading and following "The Master Class" instructions to the letter. Be that as it may, my dough (on Day Two) is just as gooey as it was yesterday when I put it the fridge for the first rising. Today, on Day Two, it did nearly double, it's still gooey and stuck to my fingers, making almost impossible to stretch and form into a ball. Once placed on the sheet pan, it failed to hold its shape as a ball. It sort'a melted. What have done wrong? What could I have done to fix it? There's a chance one of the measurements was off. A digital scale is highly recommended. If it was a mistake and the number was way off, then it's a simple mistake and easy to fix next time around. The other possibility is that you're not accustomed to working with a "wetter" dough. The Master Dough in the The Pizza Bible has a higher "hydration point" than the average recipe. This makes a better end result, but is also a little trickier to work with. Getting used to it will take a little bit of practice. One thing I recommend is keeping a bowl of water nearby. When you're ready to handle the dough, dip your fingers in it. This helps with the sticking quite a bit. Also, when you're ready to shape the dough and turn it into a pizza, don't afraid to dunk the ball into a bowl of flour. You can shake off the excess during the course of shaping and stretching. I'd highly recommend baking it. Some pizzerias make dough with a hydration point as high as 85%. That is, for every hundred grams of flour, 85 grams of water is used. Hope this helps, and let us know how it turns out. Hi, Raj. Thanks for the reply! See attached photo. I bought brand new digital scales, one that measures in one-hundredth of a gram. I doubt the measurements were off. My dough ball (and I use the term loosely) doesn't look like Tony's picture in the book under "3. 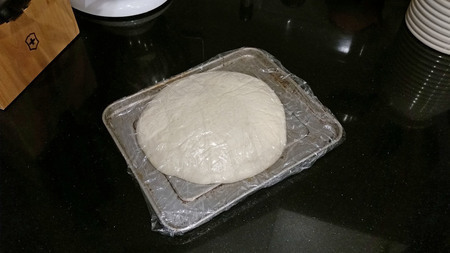 Refrigerating the Dough", step 6. What kind of flour did you use Jay? The Pendleton Power - High Gluten I order from you folks. My plain is to go ahead try to use it for a pizza tonight for dinner. You should definitely make a pizza with it. Chances are it will turn out well. My dough never got that "dry" (as shown in the video) or that firm, it has always sticky for the beginning. When I tried to ball the dough, like in the video, it stuck to my hands and would not maintain any shape. As I've thought about it, I don't know how, but I've either got too little flour or too much water. But I will press forward. Thanks, again. Will let you know how it turns out after it's baked. Made the pizza. The dough was not firm enough to really work with as one would require. It did bake up nicely--crispy outside, chewy inside. However, although it would have never won a pizza beauty contest, it tasted great. I have no doubt if I were to have entered it in the Ugliest Dog contest, it would have won, hands down. You are in South Florida right? Maybe the heat and humidity played a minor or even major part depending upon how close to the water you live and the actual room temperature. What stage is the picture? Final proof and coming to room temperature? I had some similar issues at first, but the dough did not spread as much as your picture. Are you following the water temps? I have noticed that even a few degrees makes a noticeable difference. The recipe calls for a little extra water if necessary but it is tempting and easy to add to much to get the dough to come together. Balling the dough is absolutely critical in my opinion. Get a small bowl of water and wet your hands before balling if the dough is still to sticky, work it into a ball and make sure to pinch/seal that end. I have just learned to make Sicilian Style dough and it is so sticky even with the oil that when you make the rustic square and fold, it literally comes together with just a little pressure and sticks together, a different kind of balling technique. Room temp was an air conditioned 73 degrees, so the humidity was relatively low. That was the morning of the second day, a few hours before coming to room temp for baking. Just it out of fridge for the picture and returned it. Yes, the water temp was as defined in The Pizza Bible. Having said that, the thermometer could have been off--it's not new. Will get a new one. Didn't add any extra water. Rather than prolonging this, I will mark it up to my making a mistake (obviously), just wish I knew what it was so I don't do it again.